What bitrates do you broadcast in? We offer 128k MP3, 128k AAC (aka AAC-LC, part of the MPEG4 standard), and 64 and 32kb AAC-HE (aka aacPlus) streams. 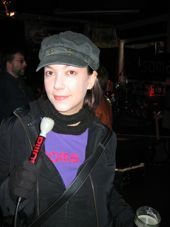 A couple channels offer experimental higher-bitrate MP3 streams. What streams are the highest quality? The 128k AAC streams are the best sounding. The 64k AAC-HE streams are a close second, followed by 128k MP3 streams. What streams does the popup player use? For widest compatibility with browsers, we use 128k MP3 streams in the popup/web-based player. 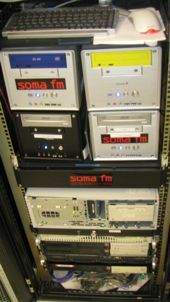 SomaFM uses Shoutcast servers, OtsDJ playout systems, Orban audio processors, Shoutcast MP3 stream encoders, and Orban Opticodec aacPlus encoders. 3GPP servers are Darwin Streaming Servers from Apple Computer. We use Ubuntu Linux servers for stream servers and web servers, connected via various bandwidth providers where we find good values on bandwidth. 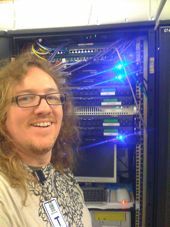 We operate a small data center out of 365 Main in San Francisco and as of 2018 are getting most of our streaming bandwitth from Unwired, LTD and Wave (formerly Layer42). We have over 9500 CDs and 217,000 digital tracks in our primary music library, although many SomaFM music directors have personal libraries as well. From this, we select only the best tracks to play on SomaFM. In the last 2 years, we've played over 13,000 different artists on SomaFM. So how do you guys stay in business? We have to beg for money a lot! But most of our listeners value what we do. We run our station on a very tight budget and rely on donations from listeners. We're lucky to have a lot of friends at indie record labels who have donated CDs for premiums or have let us include some of their music in our compilation CDs. 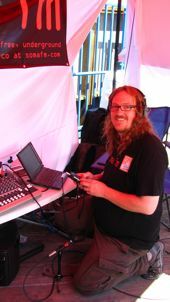 And we're thankful to the folks at Shoutcast.com who have provided us additional streaming bandwidth in the past. Our goal is to make SomaFM available in as many ways as possible - from internet radio, to cell phones and wireless devices, smart speakers, in-car entertainment systems. 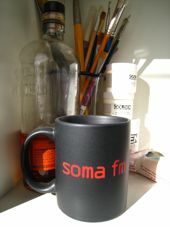 Wherever you are or whatever you're doing, we want to make SomaFM available to you. 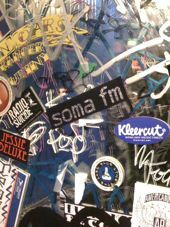 Through SomaFM's partnership with various public radio stations, we're making our programming available over the air by providing a special version of Groove Salad for use on their HD multicast channels. KPBS-FM in San Diego is our premier public radio partner, broadcasting our programming on their HD3 channel. We also plan to launch more channels and specialty on-demand and podcast programs. Since we have such a small budget, we have to move slowly. But because we don't have to answer to investors or VCs, we can broadcast exactly what we want to.